Earn up to 391 reward points for this purchase! p300, also known as EP300 or E1A binding protein p300, is a universally expressed, reasonably stable nuclear phosphorprotein that is closely related to CBP (or CREB). CBP and p300 are identified as transcriptional coactivators that can directly interact with several different DNA-binding transcription factors including nuclear hormone receptors, CREB, c-Fos, C-Jun/v-Jun, c-Myb/v-Myb, TFIIB and MyoD. These two proteins have been known to exhibit histone acetyltransferase (HAT) activity and can acetylate all four core histones in the nucleosome. It is believed that both p300 and CBP may be directly involved in activating chromatin for transcription. 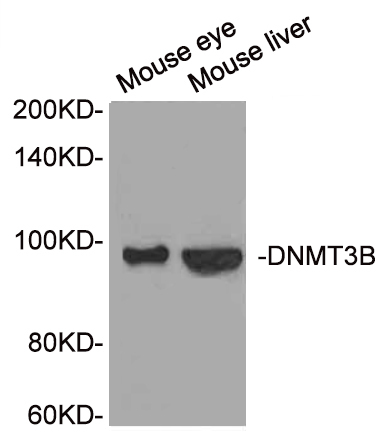 p300 Polyclonal Antibody. Unconjugated. Raised in: Rabbit. Synthesized peptide derived from the N-terminal region of human p300. Store at -20°C or -80°C. Avoid repeated freeze. WB: 1/500 - 1/2000. IHC: 1/100 - 1/300. ELISA: 1/10000.